It wouldn’t be a party without cake. The Green Door, Watson’s Pharmacy, REALTOR® Daria Kirk, Fiesta Party, Loblaws, ScotiaBank, Greystone Village and Farm Boy Trainyards plus some generous families made all of this happen with their donations. Have you ever eaten a piece of cake beside a chinchilla? Slurped lemonade with a snake? 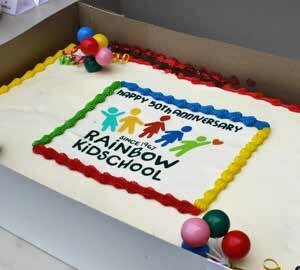 If you were at Rainbow Kidschool’s 50th anniversary BBQ, you can now say that you have. The Rainbow staff entertain and educate the community’s kids throughout the year, but on this special occasion in June, they showed they are great at throwing celebrations too. This year is Rainbow’s 50th anniversary and to celebrate they invited the community to a free BBQ with food, balloon twisting, exotic animals, live music, games and giveaways. Even the Mayor of Ottawa stopped by to say congratulations. Close to 200 people, and at least 10 exotic rescue animals, filled the schoolyard at Lady Evelyn where Rainbow Kidschool operates. 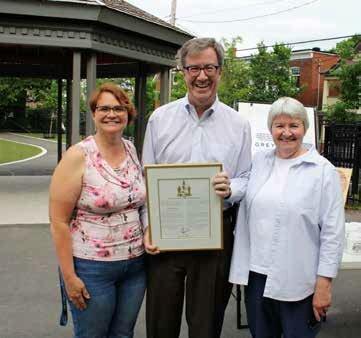 From local donations to the volunteers who BBQd and contributed, the party had a strong community spirit and reminded parents and kids alike what a great support the school is in Old Ottawa East.